The studio-house can be visited every first Saturday afternoon (2 – 6 p.m.) of the month (except for August) provided you announce your arrival in advance via info@vandoesburghuis.com. During the Journées Européennes du Patrimoine (the French Heritage Open Days), in the third weekend of September, the Van Doesburg house is open to the public free of charge. So a visit up to a group of five persons to the studio-house costs nothing, but donations are welcome. From groups of six persons onwards we ask a contribution of € 5,- per person. Admission is free for kids and young people aged up to 18 and under. The address of Van Doesburg house is 29 Rue Charles Infroit, in Meudon-Val-Fleury, 5 minutes walking distance from the RER station. The Van Doesburg house is an artist residency. 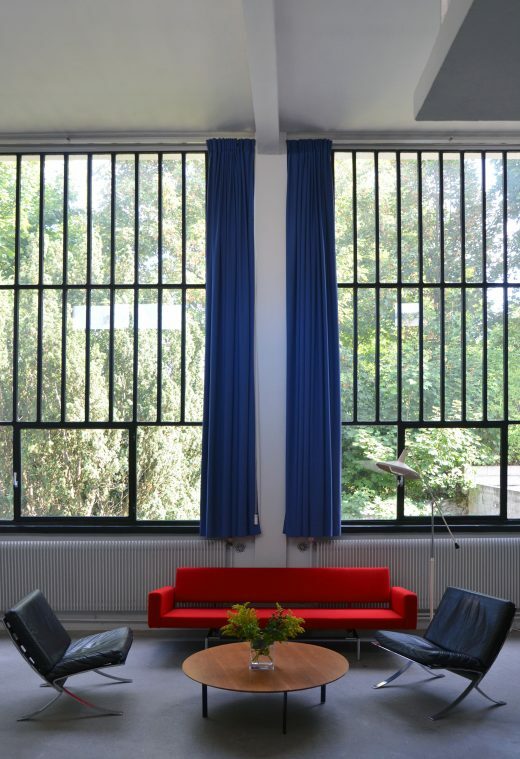 Anyone wishing to stay at the Van Doesburg house must work professionally in the arts, in one of the disciplines in which Theo and Nelly were active – the visual arts, design, architecture, literature and the performing arts. Furthermore the artistic practice of the resident in one way or the other is characterized by pushing the artistic boundaries and explore, merge and or experiment with different art forms within an international context. Besides that, the motivation to create new work, carry out research or realize a project in Paris, possibly in collaboration with a French cultural institution, is also a factor. In the period 2018-2020 the Foundation collaborates with the Dutch public cultural funds: Mondrian Fund, Creative Industries Fund NL, the Performing Arts Fund NL, Netherlands Film Fund and Dutch Foundation for Literature. These funds publish open calls for makers and thinkers within their fields, so we advice you to keep an eye on the websites of these funds. The board of the Van Doesburg House Foundation attaches great importance to keeping Theo van Doesburg’s ideology alive and enabling new generations of artists, designers, musicians and other performing artists to be exposed to it. Also, occupants should keep in mind that the Van Doesburg house serves a public function as a listed building and that parts are open to the public. A visit to the studio-house is always arranged in liaison with the occupant. In addition, he/she is requested to help with the upkeep of the house and to treat it with care. The house must be vacated in the state in which it was found. 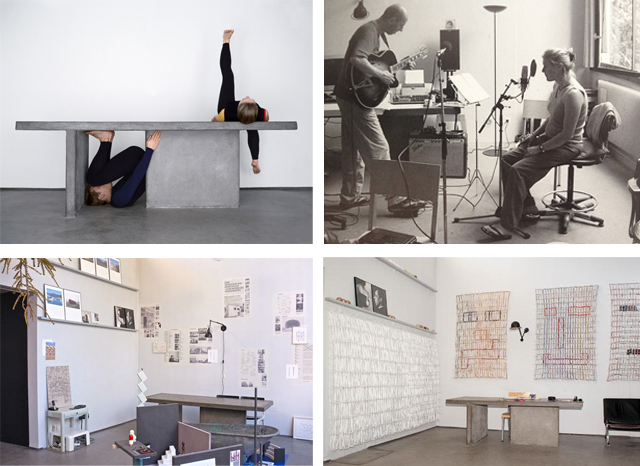 Clockwise from left top: homage to Theo and Nelly door Ilse Leenders (2005), Marc van Vugt and Ineke van Doorn at work in the studio (2001-2003), installation of Lam de Wolf (2009), exhibition of Jean Bernard Koeman (2014). The Van Doesburg house is situated in the quiet, wooded surroundings of Meudon-Val-Fleury, a pleasant suburb of Paris. There is a direct RER (rapid transit system) connection from Meudon to the centre of Paris (approx. 30 minutes). The studio-house is a two-floor building, with the main storey on the first floor. It comprises the high studio space (7.5 x 6.5 and 5 metres high), in which two spaces can be partially closed off, but can also be combined to form one room; plus a side room and a bathroom. The ground floor contains the kitchen, one large and one small room, a shower plus lavatory and a boiler room/storage space. There is a small garden at the front of the house and at the back, a covered terrace and garden. The house contains original furniture by Cees Braakman, Wim Rietveld and Steen Østergaard, plus two chairs (reissues) which Theo van Doesburg specially designed for the studio-house. There is also a piano (Sellier) in the house.